Egypt's Morsi Accused Of Aiding Iran's Revolutionary Guards : The Two-Way The ousted Egyptian leader is accused of being part of a wide conspiracy to destabilize Egypt involving, among other things, passing state secrets to Tehran. 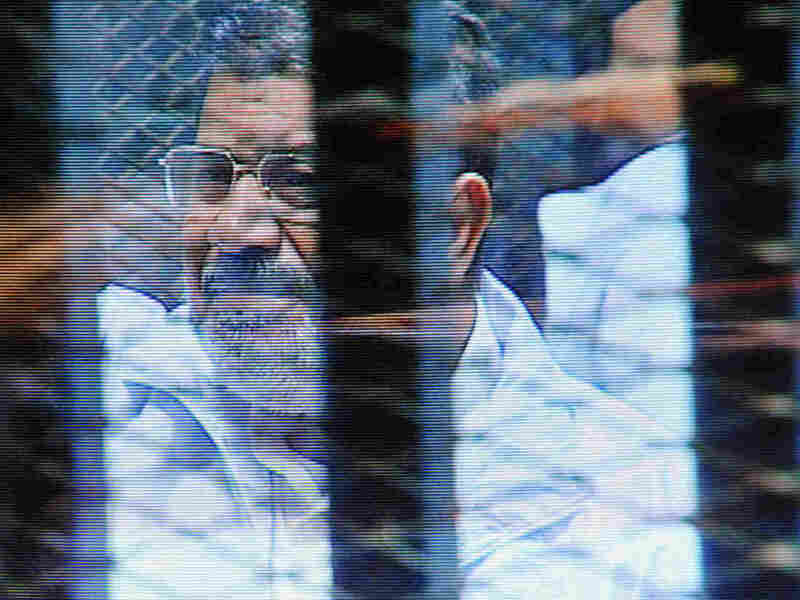 Egypt's ousted President Mohammed Morsi in a soundproof barred glass cage is seen during a court appearance on Feb. 16. Ousted Egyptian President Mohammed Morsi has been accused of passing state secrets to Iran's Revolutionary Guard at a hearing at the jailed leader's trial in Cairo. A prosecutor at the hearing said Morsi, who stands accused of numerous charges, was involved along with 35 others in a plot to destabilize Egypt. "Mr Morsi's supporters say he and other senior Muslim Brotherhood leaders are the victims of politically motivated prosecutions. The espionage trail opened on 16 February and on Sunday prosecutors detailed the charges against Mr Morsi and his co-defendants." Specifically, Morsi is accused of delivering national defense secrets and "providing the Iranian Revolutionary Guards with security reports" in an effort to destabilize Egypt. He is also charged with "conspiring to destabilize the country and cooperating with foreign militant groups - including Palestinian Hamas and Lebanon's Hezbollah," The Associated Press reports. "The case's chief prosecutor, Tamer el-Firgani, divulging details of the charges, said national security reports meant for only Morsi to see were emailed to some of these foreign militant groups. One report, he said, was sent to the Iranians about the activities of Shiite Muslims in Egypt. Iran is mostly Shiite." Morsi's trial was adjourned until February 27.